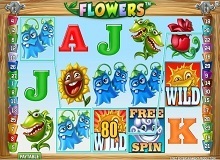 In April 2011, Netent has introduced its new masterpiece Flower Slot. With 5 reels and 30 paylines, your job would be matching up the flowers’ types in order to impress your boss, the flowers’ shop owner. Once you do, you’ll find yourself flooded with extra bonuses besides your normal payout. You’ll find it so much fun as well as rewarding and paying off to work at this flower shop. The game is featuring some very creative yet simple graphics, it’s shown in the doubling icons, the flowers that do stand apart from the crowd and also the wild signs and the 30 spins featured at a 3x multiplier. All of that is bound all together in order to maximize your winnings. If you are already an online gamer, you probably would be familiar with the existence of high and low paying cards, wilds and scatters. The low-value symbols introduced above acts as both single symbols and double symbols. While the Sun acts as the wild symbol and the Scatter is represented as a free spin. If you got a double symbol, this would be counted as two single icons. You can choose to activate any number of paylines up to 30 by using the lines tab. And also, you can set the bet value to vary from 1 to 5 coins per spin with a coin value that ranges from $0.01 and goes up to a maximum of $0.50 per coin. After that, all you need to do is press the spin button, max bet button in case you want to bet with the maximum stake or autoplay button and wish for the best. As mentioned above, your wild symbol will be the sun which can replace any single symbol or double symbol on the reels and still carry the game’s coin jackpot. And also if you got the free spin icon, you’d need to make at least three of it appear in order to trigger an award of 2x your bet stake, or if you were lucky enough to get 4 of it, it would trigger a free spins round. The biggest draw that you should aim for while playing Flowers Slot game is grabbing the maximum number of spins as this is where this game has its treasures. Without the free spins feature, this game would have been a very low paying game. Four scatter symbols in any position on the screen awards you 10 free spins. Five scatter symbols in any position on the screen awards you 15 free spins. Six scatter symbols in any position on the screen awards you 20 free spins. Seven scatter symbols in any position on the screen awards you 25 free spins. Eight scatter symbols in any position on the screen awards you 30 free spins. 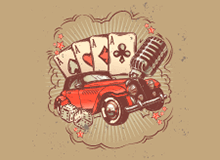 While the free spins round is active, all the winnings are being tripled. Also, do not neglect the fact that you’ll still be granted from 2x to 10x multipliers on getting three scatter symbols at any time. In regards to the wild symbol which is represented as the Sun symbol, it grants you a payout of 5000 coins with its present value in case any player got five sun symbols combination on the game screen. The scatter symbols will only appear on reels 2, 3, and 4. While the wild symbols will be represented on reels 1 and 5 only. While playing Flowers slot machine online game, you’ll find it fun and cute with no cheats or sophisticated rules and relatively high RTP in comparison with the casinos’ online slots. It has an RTP of 96.4%. NetEnt has developed Flowers slot free game knowing that it all depends on the bonus rounds seekers, it was made for them. 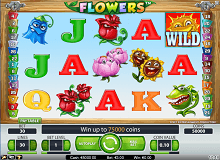 Flowers casino slot online game is not dangerous to play as it doesn’t need high budget bets to grant big winnings so you wouldn’t have the risk of losing all you have and end up in tears. 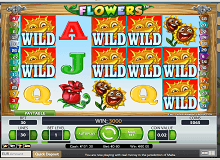 Flowers slot game is playable on android, ios mobile phones, tablet devices, and desktops.